요즘 Andre Michelle이 음향 관련 놀이를 자주 한다는 생각을 했는데 결국 이런 멋진 결과물을 만들어 냈다. 오디오나 음향 관련 지식이 부족한 나에게 이걸 가지고 놀아보라고 하면 아마도 헬리콥터 장난감을 물 속에서 가지고 놀지 싶다. 플래시와 자바를 가지고 개발 했다고 하는데 앙드레의 고집스런 뚝심을 따라가려면 아직도 멀었다는 생각이 든다. 일본의 한 미술관 매점 단말용 컨텐츠로 제작된 사이트라고 한다. 단말기의 최소 해상도가 1920x1080이기 때문에 그 이하 해상도에서는 짤려서 보이고, 로컬에서 서비스되기 때문에 로딩 처리가 되지 않아서 이미지가 뜨기까지는 약간의 시간이 필요하다. 심플한 디자인과 절묘하게 어울리는 효과음이 전체적으로 사이트의 느낌을 살리고 있다. 가장 훌륭한 점은 정보 설계로부터 플래시 컨텐츠의 효과를 1:1로 적절히 사용했다는 점이다. 사용자 경험은 관계에 영향을 많이 받는다고 생각한다. 여기서 관계라는 의미는 연결을 의미하는데, 예를 들면 화면 밖에 있는 오른쪽 이미지를 보기 위해 현재 이미지를 왼쪽으로 밀어서 사라지게 하는 행동은 우리의 머리 속에서 현재 사진과 오른쪽 사진은 보이지 않는 선으로 연결되어 있고 화면에 보이는 사진을 왼쪽으로 보내면 오른쪽에 있는 사진이 나타날 것이라는 추측에서 비롯된다. 이 사이트의 경우도 뎁스의 트리형태 정보구조를 표현함에 있어서 틀 속에 틀이라는 형태로 진행하고 있어서 정보의 전달이 명확하다고 볼 수 있다. 다만 아쉬운 점은 각 뎁스별 현재 위치(컨텐츠 그룹명)에 대한 정보 전달이 화면 모션으로만 이루어지고 있어서 사용자가 기억하고 있어야 한다는 점이다. 왼쪽의 Power of Information 텍스트를 일률적으로 할게 아니라 각각의 뎁스에 따라 정보구조명을 적용했더라면 하는 생각이 든다. 예전에 System.gc 내장 함수가 없었던 것으로 알고 있는데 업데이트 버전에서 생겨난 듯 하다. 기존에는 개발자가 강제로 CG를 실행시킬 수 없어서 완전한 메모리 테스트는 사실상 불가능 했다. 물론 강제로 많은 오브젝트를 생성하는 과정에서 일정한 메모리(FlashPlayer가 예상하는 적정 사용영역)을 벗어날 경우를 임의로 만들어서 확인할 수는 있었으나 이것 또한 어느 정도의 메모리 영역을 CG가 동작하는 시작점으로 보는가를 알 수 없기 때문에 어려움이 있었다. System 클래스에서 지원하는 메소드에 gc가 있다. 이는 자바에서의 System.gc와 같이 이 함수를 실행하는 시점에서 강제로 CG가 동작하게 된다. 문제는 자바와 같이 플래시도 full gc를 할 경우 시스템 리소스 낭비가 예상된다는 것이다. System.gc 실행은 개발 테스트 과정에서 사용하되 작업물에서의 동적인 강제 실행은 피하는 것이 좋을 듯 싶으나 이는 이미 웹상에서는 System.gc가 작동하지 않는 듯 싶다. 경험상 flashPlayer9버전의 가비지콜렉터는 상당히 안정적이고 신뢰 할만 하다. 아래 예제로 만든 것을 보면 replay 버튼을 누름과 동시에 Event.ENTER_FRAME 이벤트가 등록된 sprite를 통해서 이벤트가 발생할 때마다 임의로 TextField를 생성과 소멸을 반복한다. 50개의 TextField가 생성되는 시점에서 Event.ENTER_FRAME가 등록된 sprite를 메모리해서 해제시킨다. 여기서 많은 개발자들이 Event.ENTER_FRAME 이벤트가 적용된 상태에서 removeEventListener로 이벤트를 해제하지 않고 sprite를 메모리 해제 시도를 했기 때문에 메모리에서 지워지지 않는다고 생각하는 듯 하다. 나도 예전에는 이 부분이 상당히 모호했다. addEventListener로 강참조를 할 경우라도 역참조가 아닌 이상은 이벤트가 적용된 오브젝트가 메모리에서 해제하고 GC를 통해서 free memory가 되면 자동으로 등록되어 있는 이벤트도 발생하지 않는다. 여기서 혼돈했던 이유는 개발자가 강제로 가비지콜렉션을 실행하지 못하는 상황에서 sprite가 메모리에서 해제되지 않아서 이벤트가 계속 발생하는 것인지, gc가 동작하지 않아서 해제되지 않는 것인지 모호했기 때문이다. 아래의 예제에서 gc 동작버튼을 누르지 않더라도 일정한 시간이 지나면 flashplayer가 적당한 시점에서 gc를 가동하여 Event.ENTER_FRAME 이벤트가 등록된 sprite를 메모리에서 해제하면서 Event.ENTER_FRAME 이벤트도 발생하지 않게 된다. System.gc를 이러한 gc의 동작을 강제로 실행하므로써 개발자에게 즉시 free memory가 되었다는 것을 알려주므로 개발과정에서 요긴하게 사용될 듯싶다. 아래 swf상에서는 System.gc 함수가 실행되지 않는다. fla를 다운로드하여 로컬상에서 테스트 해보길 바란다. TweenBencher 을 이용해서 AS3용 Tween 엔진을 테스트 해 봤다. 1등은 단연 Simple AS3 Tween으로 나왔는데 이것은 따로 클래스화 되어 있는 것이 아니고 fl.motion.easing.Exponential 의 easeInOut 함수만을 따로 빼서 직접 width을 적용한 형태라서 빠를 수 밖에 없다. 테스트를 하지 않은 fl 기본 트윈 클래스나 기타 다른 것들은 비교할만한 속도를 내지 못하여 제외 하였다. 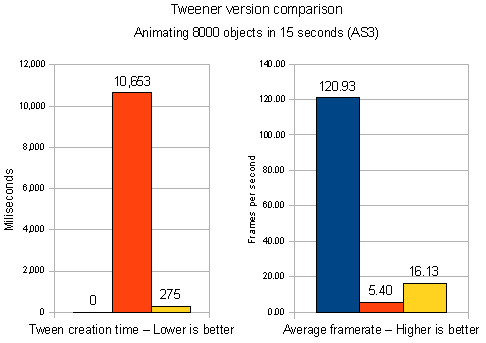 비교 대상이 되는 것들은 Tweener와 TweenLite이다. Tweener은 그 사용법과 Bezier 곡선 처리 기능을 제공하기 때문에 사용성면에서 좋은 엔진이지만 많은 기능들이 포함되어 있는 만큼 속도는 약간 떨어진다. TweenLite는 filter에 관련된 기능들은 TweenFilterLite로 따로 빠져있다. 특별한 기능이 아닌 오브젝트의 모션 처리는 x,y,scaleX, scaleY, width, height, alpha 등과 추가하면 color 적용일 것이다. TweenLite는 tint 속성으로 그것을 대신하고 있다. 기본적인 사용법은 아래와 같다. Description: Tweens the target's properties from whatever they are at the time you call the method to whatever you define in the variables parameter. alpha: The alpha (opacity level) that the target object should finish at (or begin at if you're using TweenLite.from()). For example, if the target.alpha is 1 when this script is called, and you specify this parameter to be 0.5, it'll transition from 1 to 0.5.
x: To change a MovieClip's x position, just set this to the value you'd like the MovieClip to end up at (or begin at if you're using TweenLite.from()). ease: You can specify a function to use for the easing with this variable. For example, fl.motion.easing.Elastic.easeOut. The Default is Regular.easeOut. easeParams: An array of extra parameter values to feed the easing equation. This can be useful when you use an equation like Elastic and want to control extra parameters like the amplitude and period. Most easing equations, however, don't require extra parameters so you won't need to pass in any easeParams. autoAlpha: Same as changing the "alpha" property but with the additional feature of toggling the "visible" property to false if the alpha ends at 0. It will also toggle visible to true before the tween starts if the value of autoAlpha is greater than zero. volume: To change a MovieClip's volume, just set this to the value you'd like the MovieClip to end up at (or begin at if you're using TweenLite.from()). onStart: If you'd like to call a function as soon as the tween begins, pass in a reference to it here. This can be useful when there's a delay and you want something to happen just as the tween begins. onStartParams: An array of parameters to pass the onStart function. onUpdate: If you'd like to call a function every time the property values are updated (on every frame during the time the tween is active), pass a reference to it here. onComplete: If you'd like to call a function when the tween has finished, use this. overwrite: If you do NOT want the tween to automatically overwrite any other tweens that are affecting the same target, make sure this value is false. Description: Exactly the same as TweenLite.to(), but instead of tweening the properties from where they're at currently to whatever you define, this tweens them the opposite way - from where you define TO where ever they are now (when the method is called). This is handy for when things are set up on the stage where the should end up and you just want to animate them into place. Description: Provides an easy way to call any function after a specified number of seconds. Any number of parameters can be passed to that function when it's called too. delay: Number of seconds before the function should be called. onCompleteParams [optional] An array of parameters to pass the onComplete function when it's called. target: Any/All tweens of this Object/MovieClip will be killed. complete: If true, the tweens for this object will immediately complete (go to the ending values and call the onComplete function if you defined one). Description: Provides an easy way to kill all delayed calls to a particular function (ones that were instantiated using the TweenLite.delayedCall() method). function: Any/All delayed calls to this function will be killed. Can I set up a sequence of tweens so that they occur one after the other? Do the properties have to be in a specific order? Why are TweenLite and TweenFilterLite split into 2 classes instead of building all the functionality into one class? File size. Only a portion of projects out there require tweening of filters. Almost every project I work on uses TweenLite, but only a few require tweening filters (TweenFilterLite). TweenLite is 2k whereas TweenFilterLite is 5k. 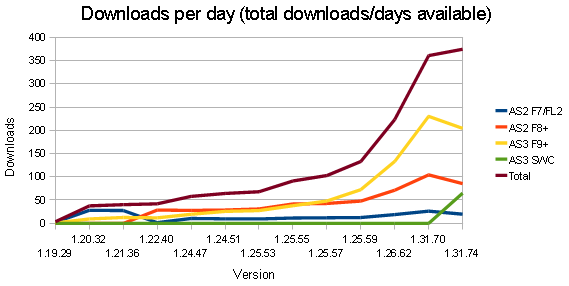 Again, one of the stated purposes of TweenLite is to minimize file size & code bloat. If someone only wants to use TweenFilterLite, fine. But I think many people appreciate being able to use the most lightweight option for their needs and shave off the 3k when possible. Do I have to pay for a license to use this code? Can I use it for commercial purposes? Feel free to take the code and use it as you wish, even for commercial purposes. Some people have requested the ability to donate money to reward the work I put into the class(es), so i put a PayPal "donate now" button at the top and bottom of the page, but you certainly don't need to donate anything. I'm just glad to help the Flash community. Are TweenLite and TweenFilterLite better than Tweener, Fuse, MC Tween, and all the other tweening engines out there? Maybe, maybe not. It all depends on your objectives, coding style, etc. I certainly don't claim that TweenLite & TweenFilterLite are superior to all other tweening engines, but in terms of the power-to-file-size ratio, I certainly haven't seen anything that comes close. Feedback has been overwhelmingly positive. I've used TweenLite for many years and it hasn't let me down. I never found myself needing features that are available in another tweening engine. But hey, to each his own. colorize: Only used with a type:"Color" tween to colorize an entire MovieClip. amount: Only used to control the amount of colorization. type: REQUIRED. A string that indicates what type of filter you're tweening. Possible values are: "Color" (for all image effects like colorize, brightness, contrast, saturation, and threshold), "Blur", "Glow", "DropShadow", or "Bevel"
delay: Number of seconds to delay before the tween begins. This can be very useful when sequencing tweens. volume: To change a MovieClip's volume, just set this to the value you'd like the MovieClip to end up at (or begin at if you're using TweenFilterLite.from()). Description: Exactly the same as TweenFilterLite.to(), but instead of tweening the properties from where they're at currently to whatever you define, this tweens them the opposite way - from where you define TO where ever they are now (when the method is called). This is handy for when things are set up on the stage the way the should end up and you just want to tween them to where they are. Description: Provides an easy way to kill all delayed calls to a particular function (ones that were instantiated using the TweenFilterLite.delayedCall() method). Can I use TweenFilterLite to tween things other than filters? In order to accommodate the specialized nature of filters, TweenFilterLite's code is a bit lengthier which translates into more work for the processor. It's doubtful that anyone would notice a performance hit unless you're tweening hundreds or thousands of instances simultaneously, but I'm a bit of an efficiency freak. Maybe, maybe not. It all depends on your objectives, coding style, etc. I certainly don't claim that TweenLite & TweenFilterLite are superior to all other tweening engines, but in terms of the power-to-file-size ratio, I certainly haven't seen anything that comes close. Feedback has been overwhelmingly positive. I've used TweenLite for many years and it has never let me down. I've never found myself needing features that are available in another tweening engine. But hey, to each his own. 플래시에서의 Public 함수 중에서 getDefinitionByName() 함수는 name 매개 변수로 지정된 클래스의 클래스 객체에 대한 참조를 반환해 준다. var c:Class = getDefinitionByName("m"+2) as Class; // 라이브러리에 있는 Linkage 클래스명 "m2"의 참조를 반환한다. 위 구글 코드에서 오픈되어 있는 flickr API adobe 소스를 UML로 변환해 보았다. 필요하신 분들은 참고하시면 좋을 듯 싶다. 기본적인 상속과 합성관계만 형성해 놓은 상태, 대부분 합성으로 페키지가 구성되어 있다. 참고. 새벽에 작성한 관계로 틀린 부분이 있을 수 있음. 예전에 만들었던 호 그리는 클래스를 응용하여 부채꼴, 활꼴 모양을 그리는 Shape를 만들고 응용해보았다. 아래 CREATE 버튼을 클릭하면 왼쪽은 SimpleFanwise를 이용한 것이고 오른쪽은 SimpleArchwise를 이용하여 20개 오브젝트 생성후 사라지는 모션을 적용해 봤다. 일본의 ASer의 포스트을 보고 나를 포함한 많은 플래시 작업자들이 개념적으로는 이해 하고 있지만 실전에서 흐지부지 하게되는 것을 지양하기 위해서 그 분의 포스트을 토대로 접근자들을 정리해 본다. 각 접근자의 개념은 아래와 같다. 이하에 패키지 A_package의 클래스 A_class를 예로 들어 아래와 같을 경우, A_package 패키지 내에서는 모두 접근이 가능하다. 동일 패키지의 상속 클래스는 private를 제외한 속성들에 접근이 가능하다. 동일 패키지의 다른 클래스는 protected 속성에 액세스할 수 없지만 internal에는 액세스할 수 있다. 다른 패키지의 상속 클래스에서는 protected에는 액세스할 수 있지만 internal에는 액세스할 수 없다. 다른 패키지의 다른 클래스에서는 public밖에 액세스할 수 없다. 예전에는 이런 구분 자체가 내 머리속을 어지럽게 하여 private와 public만을 사용했었다. AS3로 넘어오면서 상속, 합성, 오버라이드를 이용한 작업이 늘어나면서 유기적인 클래스들과의 관계 중심으로 구조를 설계하다보니 클래스 간에 접근 규정을 코멘트로 달아놓지 않는 한 스스로 혼란스럽게 되었다. 보통 private로 해두고 protected→internal→public 방향으로 작업을 하면 되겠으나 이것 또한 중간중간 에러체크를 감당해야 하는 부담을 지울 수가 없다. 확실히 private, protected, internal, public을 구분해서 작업 하는 것이 현재 작업자에게도 큰 도움이 된다. 가장 바람직한 방법으로는 작은 프로젝트라도 작업에 들어가기 전에 구조를 설계하고 노트에 UML 비스무리한 낙서를 하고 시작하는 것이 좋을 것 같다.